Process owners and individuals can now implement their OWN enterprise solutions - they don't need us for that anymore. So, what then becomes the role of the Information Professional? 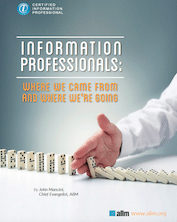 We've got all the answers for you in our free eBook, Information Professionals: Where We Came From and Where We're Going. Simply fill out the form on this page to get your free copy!